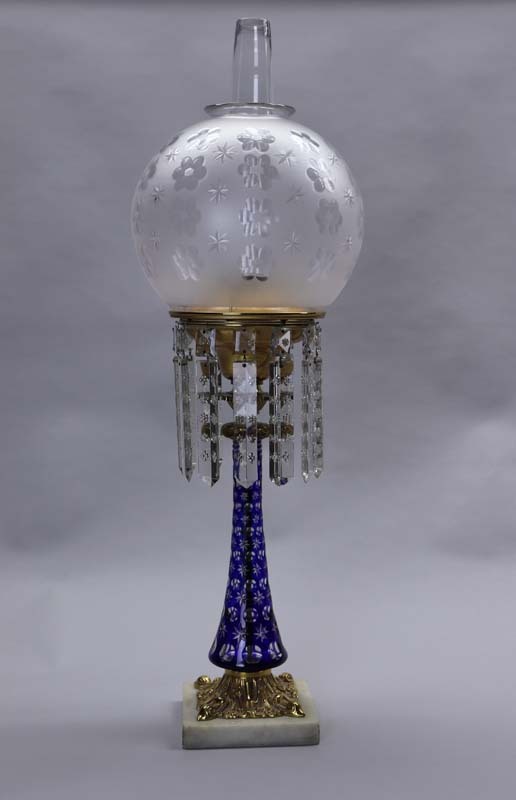 This stunning table lamp is a recent addition to the DAR Museum collection. 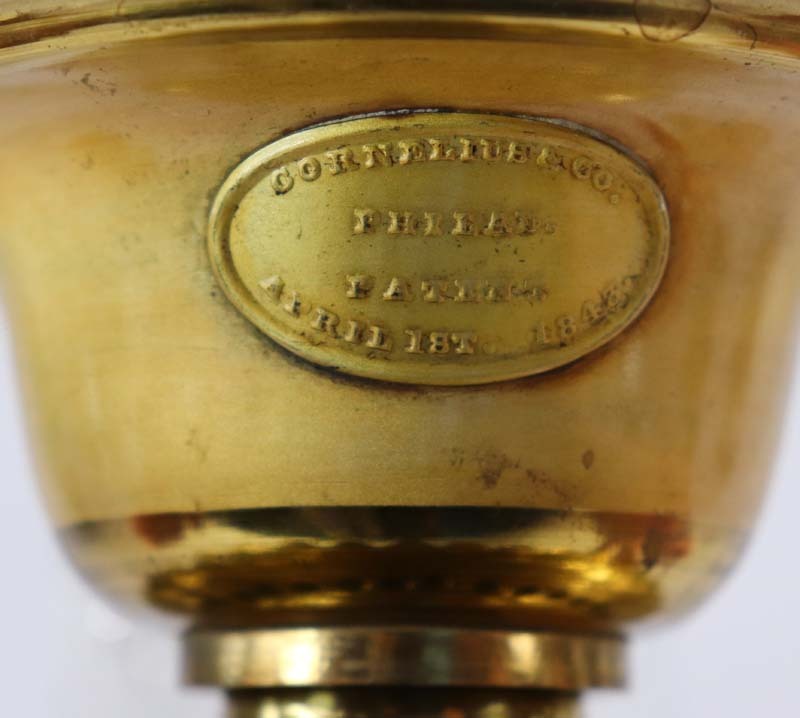 The famous Philadelphia lighting manufacturer Cornelius and Co. manufactured this between 1846 and 1851. It is made out of brass, marble and cut glass and fashioned in the then popular rococo revival style. People called these “solar lamps” because the flame burned bright like the sun. Of course brightness is relative by today’s standards, but in the 1840s the only alternative to an oil lamp was the candle which did not burn very bright. 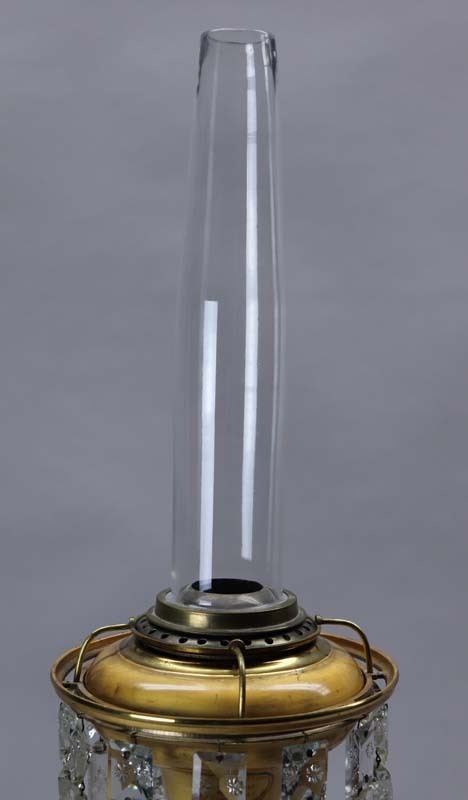 Patented in the United States in the early 1840s, solar lamps feature the Argand burner. Swiss inventor François-Pierre-Ami Argand developed this specialized cylindrical wick in the 1780s. This type of wick not only burned more efficiently, but also much brighter than a candle. The secret to brighter light relates to the hollow center that allowed for better air circulation and a brighter flame. Users could adjust brightness by turning the outer ring causing the cylindrical wick in the center to move up or down. Either whale or colza oil was placed into the pear shaped reservoir located below the burner. 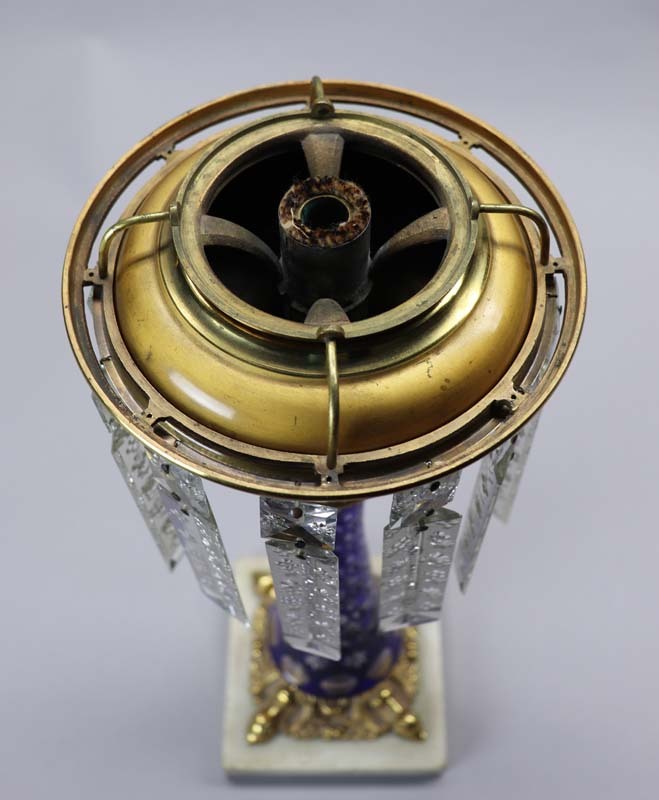 The glass chimney placed over the burner further enhancing efficiency and directed any smoke away from the user. The cut glass shade shielded the harsh flame from view. Solar lamps could be placed anywhere in the home. Most often users put them on a table located in the center of a room. 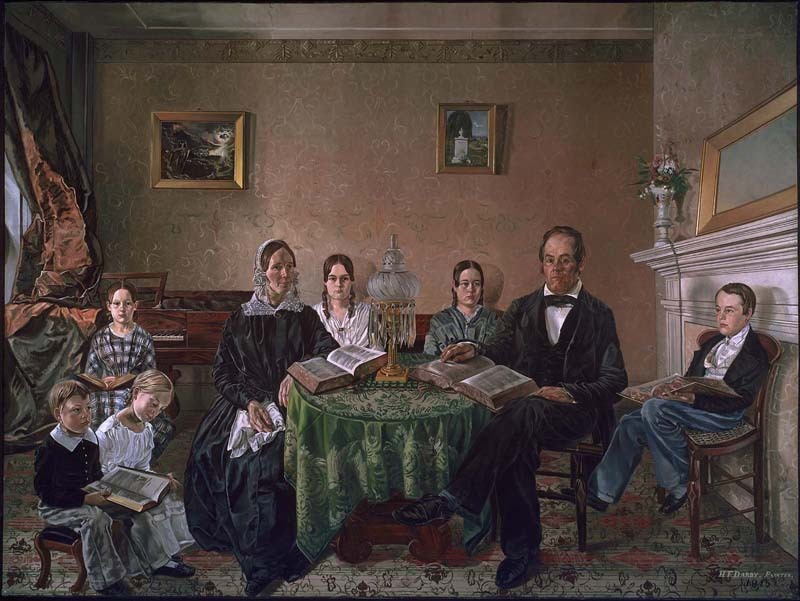 Paintings often depict center tables with prominently displayed solar lamps. Lamps came in a variety of price ranges, finishes and styles. Pressed and cut glass prisms surround and help hide the reservoir while their faceted sides reflect the light. 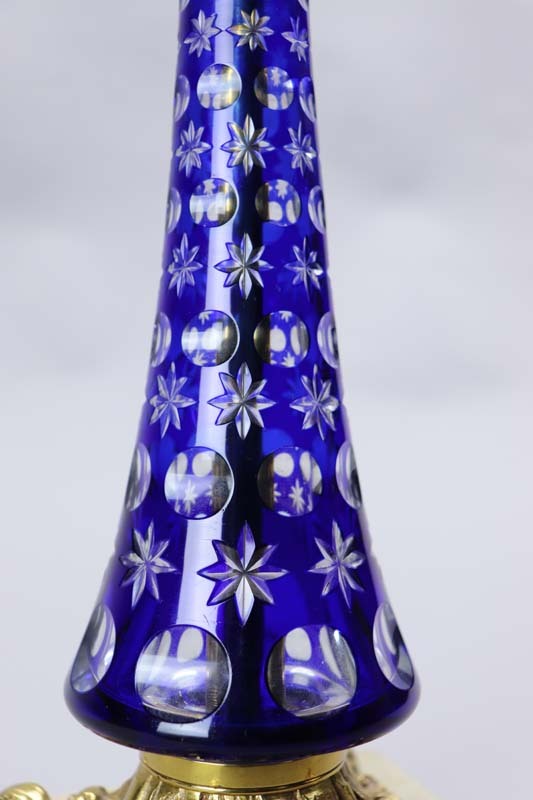 This lamp also features a rare cased cut glass stem. Cornelius and Co. ordered glass stems from the Boston and Sandwich Glass Company of Sandwich, Massachusetts. This firm made the earliest case glass in the United States starting around 1846. This lamp survives in remarkable condition retaining its original shade, chimney and factory finish. It has never been electrified. We are most grateful to the Ohio State Society for providing the funds to help purchase this important object. It is on display it in the Ohio period room. #TBT 125 years ago, on April 19, 1894, the Sequoia Chapter in San Francisco, California, planted a �... 20 hours 18 min ago.